It’s weird, but some pretty butch females gravitate to this monster. 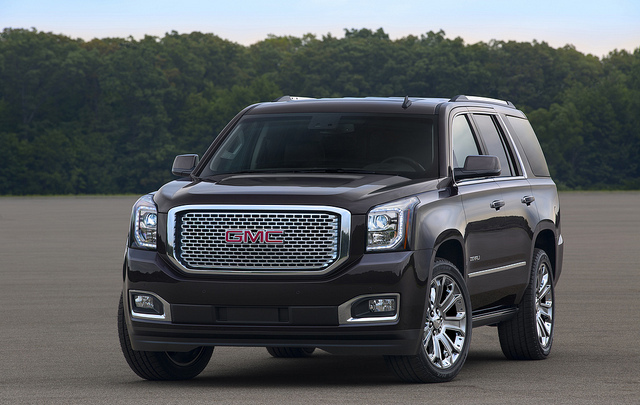 That’s as close as the GMC Yukon will ever get to being unmanly. If automotive dictionaries had an entry for “manly,” this is truck that would be pictured. The massive V-8 engine produces amazing horse power and torque. It will not only carry a load of kids but will take off pretty fast on the other side of the school zone. This truck is about dauntless power. It’s stout-hearted all the way. With all that manliness, let’s try to remember the little ones we abandoned to the interior. The three rows of bucket seats and a bench seats guarantee the kids will be secure. The Yukon has plenty of room for passengers, big and small. Sure, a kid looks lost in the auditorium-like space, but once buckled down and streaming a favorite Online Disney show, they’re smiling. Except for the lack of lumbar support, this is the most courageous choice to replace the minivan. Can you imagine explaining to the spouse a Yukon in the driveway? That takes guts.